Tim Taylor and the crew of the RV Tiburon launched an expedition to locate the lost submarine in the Fall of 2010. They discovered her on October 10, 2010 and launched repeat expedition in 2012 and 2014 to photograph and map the entire ship. Following the discovery Christine Dennison and Tim Taylor undertook the mission of seeking out family members of the entombed crew. They shared their findings and collected interviews all th while researching the cause of the sinking. Their production of “Expedition R-12- Discovering Americas Forgotten Submarine” chronicles the subs history and their expeditions. They currently give outreach presentations of the findings and are coordinating future exploration efforts. Their work is performed with permits from the Naval History & Heritage personal command’s (NHHC). The R-12 is one of 30 R-Class vessels of which fifteen were commissioned and built by the Fore River Shipbuilding Company of Quincy Massachusetts. She was laid down March 28, 1918 and launched August 15th 1919. Sponsored by Miss Helen Mack and commissioned September 23, 1919 with Lieutenant F.J. Cunneen in command. The R-12 remained in Boston until her first patrol down the coast on March 11th 1920. She operated out of New London Connecticut through the end of May that year and then set sail to Pearl Harbor, Hawaii via Panama Canal with a stop in San Pedro, California. Arriving in Hawaii she operated from there until the end of 1930, close to ten years. December 12th 1930 she returned to New London and arrived January 9th, 1931. Once in New London she conducted exercises with destroyer squadrons and trained personnel assigned to Submarine School until her departure on September 27th 1932 to the Philadelphia shipyards, decommission and berthed with the Reserve Fleet on December 7th, 1932. As the 1930’s came to an end the war in Europe was getting closer. The US. German U-boats had expanded their hunting grounds and the US was moving toward war. All assets available were being readied and one thing was certain, the Submarine force would play a key roll. Although built two decades earlier, the R-class submarines would see action again as a country prepared for the next Great War. Thus, the R-12 was recalled July 1st 1940, sent to New London for complete refit for activation and fully re-commissioned October 16th that same year. Sailing for Panama on December 10th she patrolled the Panama Canal Zone until October 31, 1941 before returning to New London and operations of the New England coast. On December 7th 1941 she was submerged off the coast of Maine when the attack on Pearl Harbor took place. Upon surfacing she was ordered to make ready for war. With only two questionable torpedo’s aboard she returned to the New London, re-provisioned and patrolled the Eastern seaboard for two weeks making port in Bermuda. She was not suited for his type of operation and after the initial shock of Pearl Harbor settled she was assigned to patrol the approaches to the Panama Canal until October 1942. This followed with three months of coastal patrols off of New England leading to February 1943 deployment to Guantanamo Bay Cub and eventually her first rotation in Key West Florida. March thru April that year she found herself back in New London where, much to the dismay of the crew, she received orders back to Key West. Since most of the crew lived in or near New London, duty in the sleepy island of 1940’s Key West was not on the top of their wish list. It was far from the tropical tourist destination it is today. The R-12 arrived back in Key West in May 1943 for her new duties of training submariners. Little did anyone know this was the last port of call for the R-12. She is destined to remain here with forty-two of her crew entombed forever. June 12, 1943 the USS R-12, she was offshore on a day mission. While on the surface between exercises she was running routine transition procedures, the forward battery compartment began to flood. The collision alarm was sounded and orders were given to blow main ballast, but the sea was faster. In about 15 seconds, R-12 was lost sweeping 5 crew off the coning tower as it plummeted to the bottom in six hundred feet of water. The commanding officer, one other officer, and three enlisted men were were rescued five hours later. Forty-two lives were lost that day. The USS R-12 was stricken from the Naval Vessel Register on July 6th 1943. Tim Taylor and the crew of his Research Vessel Tiburon launched an expedition to locate the lost submarine in the Fall of 2010. They discovered her on that fall and launched repeat expedition in 2012, 2013 and 2014 to photograph and map the entire ship. Following the discovery Christine Dennison and Tim Taylor undertook the mission of seeking out family members of the entombed crew. They shared their findings and collected interviews all the while researching the cause of the sinking. Their production of “Expedition R-12- Discovering Americas Forgotten Submarine” chronicles the subs history and their expeditions. They currently give outreach presentations of the findings and are coordinating future exploration efforts. 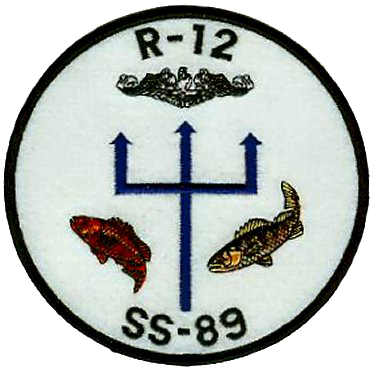 RR-12 remains US Navy property and is protected from unauthorized disturbance under the Sunken Military Craft Act (SMCA)-12 remains US Navy property and is protected from unauthorized disturbance under the Their work is performed with permits from the Naval History & Heritage personal command’s (NHHC).Sunken Military Craft Act (SMCA). All work is performed with permits from the Naval History & Heritage personal command’s (NHHC).